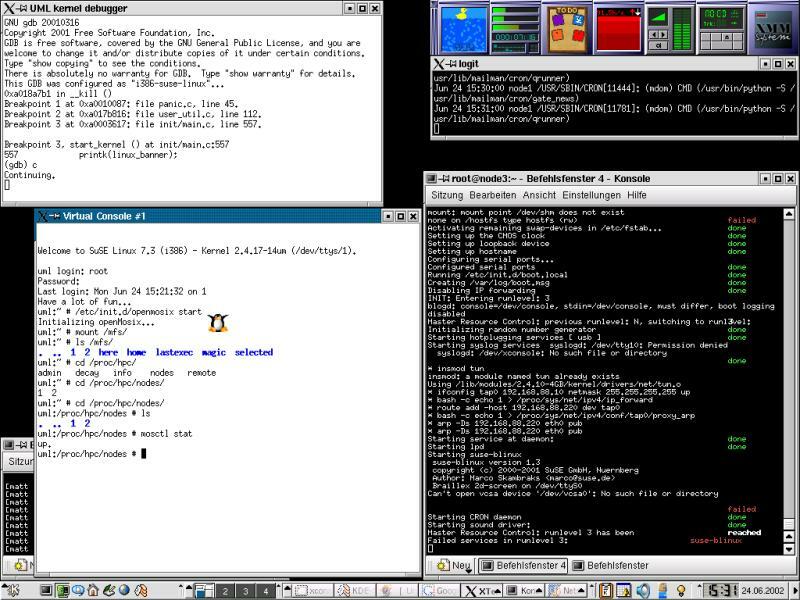 of openMosix and User-Mode Linux. and report bugs or submit patches to me. and the most of the openMosix-functionality are working. or execute the kernel in single-step mode. Sorry, but process-migration is not working yet! like it is now. If you have a solution it is welcome for sure. UML means "User Mode Linux". It is a possiblity to Run Linux inside itself. in the internals of Linux, all without risking your main Linux setup. virtual resources than your actual, physical computer. Disk storage for the virtual machine is entirely contained inside a single file on your physical machine. You can assign your virtual machine only the hardware access you want it to have. damage your real computer, or its software. openMosix is the GPLv2, Open Source, project to extend Prof. Barak's outstanding Mosix project. highly regarded Linux Clustering solution available as open source. of the GPL code and started to immediately improve and extend the solution. contains my current sources (and problems) from the umopenMosix. If you want to help please download this patch here patch_umopenmosix_devel_003.gz. your "old" /usr/src/linux directory before ! source directory. Also there is a file called "howto_compile.txt"
which contains the commands to create a um-openMosix kernel. Be sure to add "ARCH=um" to all "make" commands !! UML-linux creates a virtual system on top of your running linux-system. which contains a complet linux-distribution for the virtual system to run on. or create them by yourself with e.g. umlbuilder. own "root_fs" filesystem out of an existing linux-distribution. is time now to boot up your virtual-openMosix system. It will try to mount the file "root_fs" in the current directory. switch on the linux command line. At boot-up a gdb-session is directly connected to your booting-kernel. your screen which prompts for login to your um-openMosix system. a "control" script to start/stop the uml-openMosix system. .... time to install the openMosix-user-tools now. is directly connected to the running user-mode linux-system. and explore its internals just like a normal user-program. Then you can type "c" in the debugger window and the system will continue to run. again and again. That could be very time-consuming. a compiler cache. It helped me very much (as well as my openMosix-cluster) and maybe it is usefull for you too. and it will use "ccache" during compilation. Process-migration is not working yet! I had to disable 3 openMosix-functions in the source-code to make it working like it is now. If you have a solution it is welcome for sure. openMosix is Copyright (c) 2002 by Moshe Bar. MOSIX is developed by Prof. Amnon Barak.